Markethouse was a wonderful surprise of a restaurant that I had been to before. Since my first visit (which I thought was awful), they have revamped their menu and the atmosphere. I enjoyed eating classic meals that I remember as a child but with a modern spin. The portions were huge but they didn't sacrifice on quality or flavors. This restaurant isn't in the best location of downtown Chicago, but it may be worth walking to after you see the pictures below. I did notice some problems with the waiting staff and also the lack of seasoning on some of the entrees. However, I still gave it a high rating because of the enjoyable experience my family and I had while dining here. It was a nice surprise to find a restaurant that bakes homemade bread and serves it with something other than packaged butter. 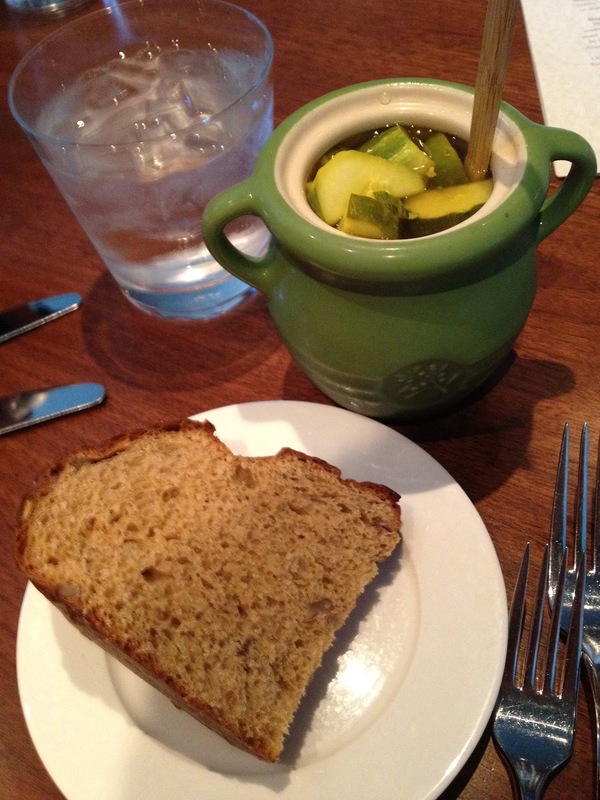 At Markethouse, they make fresh pickles to compliment their warm bread. The pickles were crisp and refreshing, especially on a hot summer day. The thick slices was a nice touch too. However, I did have one complaint... the pickles were supposed to be spicy, but instead they were almost too sweet. After a bit of confusion, we went ahead and ordered the hummus. They make their hummus in-house and this one was with roasted red peppers and cucumber. They topped it all with a pine-nut and microgreen relish and I believe a crumbed goat cheese. The vessel for the hummus was herbed flatbread. Overall, the hummus was too chunky and dry for my liking. It definitely had a lot of flavors with the addition of the relish and cheese, but the actual hummus was very "chick-peasy." It is a good appetizer to share with a big group, but if you are eating alone or with only one other person... I wouldn't order this one. So this is definitely not your typical meatloaf. My little brother chose this entree and I was glad because I was excited to see how they prepared it and how it tasted. The meatloaf is made to order (not a huge loaf cut to order)... Each is a huge ball of meat with ground of veggies and some seasonings. It was served with a twice baked potato and placed on a bed of roasted vegetables. The meatloaf was cooked nicely... it wasn't dry at all. However, I thought they were a little light on the seasoning. Luckily, the meatloaf was covered in an amazing gravy which gave everything that "homemade" flavor. First of all, I couldn't believe I forgot to take a picture of the inside of this chicken pot pie. So sorry about that. Anyway, they advertise the pot pie without chicken... but for an additional cost, they will add meat. The pot pie consisted of chicken, mushrooms, artichoke, onions, potatoes, and asparagus. My brother's fiancé ordered this meal and I wasn't sure how much asparagus was actually in it. I was lucky to snag a bite or two of the meal and I was impressed. The flaky crust was delicious when soaked in the truffle cream and all the components were cooked tender. I didn't taste much truffle so I think that may be a little over the top, but all in all, I really enjoyed the pie. So my mom was craving a burger and this was the only one they offered. Towering above the plate was a huge 10oz angus patty cooked medium well and stuffed with BBQ short ribs, roasted peppers, and grilled onions. The huge patty was topped with fried onion rings and the typical burger condiments... lettuce and tomato. It also came with a side of thick cut french fries seasoned pretty generously. I gladly took home over half of the burger once my mom was full and enjoy every bite of it. So I was craving fish and thought the rainbow trout would be a good option. It was an interesting plate. First of all, the fish was whole but had been de-boned. It was my first time actually eating de-boned fish and it was a pleasant surprise. It was lightly grilled with the skin on, giving it more of a fishy flavor than some people might like. There was some kind of artichoke or asparagus puree on the plate which was absolutely awful. I made sure to scoot it off to the side of my plate. It also came with a wild rice side with micro greens and some dried duck. The dish was nice and filling, but I probably wouldn't order this one again. My older brother chose the fish and chips... another huge dish with tons of beer battered pollack. The breading on the fish wasn't too thick and surprisingly it wasn't as oily as I was expecting. They were served with the thick cut fries as well. I was hoping they would get the concept of the "chip" like in London, but, like most places, fries are the substitute. Add a little lemon juice and tartar sauce to the fish added some great flavors. This dish, ordered by my dad, definitely had the best presentation. It was a huge pork shank sitting atop a bed of barley that was quickly cooked with bacon, potatoes, and a few veggies. Everything was then covered in a au jus of the pork. Best of all, they used the foam technique to cover the shank... I believe it was celery root foam. Overall, the pork was fall-off-the-bone tender and had some flavors. I still found it a little bland if you don't dip it in the au jus or eat it with the barley. In other words, it couldn't really stand alone. The portion was huge and a great value. I would try it again. Before dinner started, my brother's fiancé snuck ahead and told our waiter that we were celebrating my brother's birthday. It wasn't the exact date, but that didn't keep them from giving him a complimentary dessert. Regardless if it was free or not, the molten chocolate cake was AMAZING (and yes free always tastes better). The cake came out warm enough to start melting the raspberry ice cream on top of it. It was extremely rich and some would say too chocolatey, but for me... it was perfect. The raspberry ice cream complimented the chocolate well, giving it a more refreshing side to the dessert. - share, share, SHARE! The entrees are huge and there is such a large variety. I suggest sharing a few different entrees! - Try the dessert! The one we had was to die for! - Don't buy any of the cookware that they are selling. I find this to be a weird concept that this restaurant takes part in.